Natarajan Chandrasekaran is the name of that combative and inspirational character who literally doesn't seek any introduction. He is the current CEO and MD of Tata Consultancy Services and now chosen as the next chairman of Tata Sons. He is likely to take charges in coming month of February 2017. People along with his colleagues who calls him "Chandra", who believes in making the impossible entity possible, is now 53 years young fitness freak who love to run before starting his daily works and schedules. Actually, he has a family history of diabetes, thus started to walk and run at the age of 45. Initially, he was only capable of running few metres only but within a short span of 9 months, gained that much of potential which led him to complete the Marathon race which was about 42 kilometres. Till then, he has participated in many Marathon events like Boston, New York, Berlin, Chicago and Mumbai. It was the year 2009 when he took over the position of COO and Executive Director of TCS and thus considered as the youngest CEO of TATA Groups. Chandra has got the business skills in his DNA without holding any degree like MBA. It came from his real life experiences. Chandra got that sort of frugality, honesty and perseverance that is required for anyone's success in life. He claims to get these from his early life influence who is none other than his father who used to take the document of every single penny he spent. 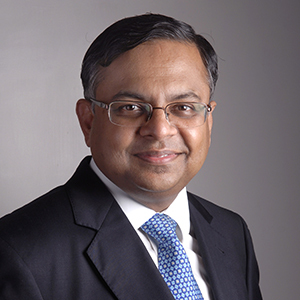 Chandrasekaran was born in the year 1963 at ( Mohanur, Namakkal, Tamil Nadu, India ) and did his Masters of Computer Applications from the Regional Engineering College, Trichy (now National Institute of Technology, Tiruchirappalli), in Tamil Nadu, India in 1986. He also holds the Bachelor of Science in Applied Sciences from the Coimbatore Institute of Technology, Coimbatore, Tamil Nadu. He started working with TCS in 1987 after gaining his Bachelors. He is also an active member of pioneer IT and Computer Science societies like Institute of Electrical and Electronic Engineers, Computer Society of India and British Computer Society. He was nominated as the Chairman of Indian IT industry body NASSCOM in April 2012. Chandra was conferred with the honorary doctorate by JNTU, Hyderabad, India (2014). He has received Honorary Doctorate from Nyenrode Business Universiteit, Netherland's top private business school (2013). Chandra has also been conferred honorary degrees by many Indian universities such as the Gitam University, Visakhapatnam, Andhra Pradesh (2013) KIIT University, Bhubaneswar, Odisha (2012); and the SRM University, Chennai, Tamil Nadu (2010). Chandra's family was an agricultural-based family by profession and had five siblings. His father, Srinivasan Natarajan, was a lawyer by profession but also managed the family farm that grew bananas, rice and sugarcane. Even Chandra tried farming for six months before realising it was not his cup of tea. He studied in a Tamil-medium government school and switched to English-medium for the senior secondary exams. He studied in a Tamil-medium government school and switched to English-medium for the senior secondary exams. He studied in a Tamil-medium government school and switched to English-medium for the senior secondary exams.